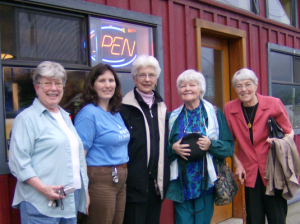 Left to Right: Jill, me, Flosey, Hetty and Dilly. Dilly has since gone on to the greatest word game of them all. In the rest of the yard, the asparagus has been declining rather a lot the last two years, the nectarine’s space is still empty, the strawberries and most everything else are hidden under tons (only a slight exaggeration) of grass and “lady’s bedstraw/cleavers” — and the figs look like they will have a nice yield in a few more weeks. We won’t have as many plums as I had hoped, but the apples are outdoing themselves this year! and the cherry tree is LOADED with fruit, we’ll see if I can get netting up in time to keep the crows off them. 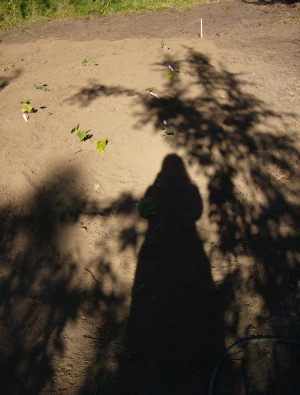 This is me, looking over the squash (which are a little droopy from the hot sun today), just past 6 pm my time. 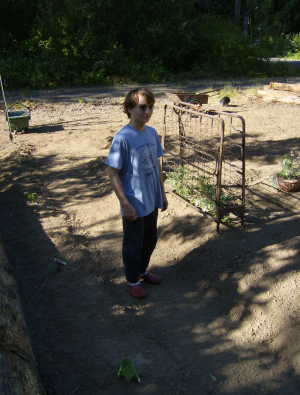 This is the stidkid, looking over the tomatoes (in the bed) and the newly seeded areas to each side (beets and carrots). And on the topic of math avoidance… I can’t say I am really avoiding it much. I have been working at rather fast pace the last couple days, doing nearly two chapters since Wednesday night. I am trying to work ahead fast enough that I will have some space and time to let things sit before the end of class. Since the teacher has me (and a couple others) working ahead of the rest of the class, I am finding that some of my questions hold me back but then get answered later on. Do I enjoy math? I can’t say that I am enjoying it any more now than in high school or the few math-intensive (but not specifically math-oriented) courses in college. BUT I can say that I am understanding things a little more, gaining some new insights into how to present the material, and learning a little bit about my own brain, so I can interpret things better for others. And that is, after all, what this course if about: learning about the processes students go through to learn basic math skills. Geared to people who teach or hope to teach in grades 1-6, it is less about learning one specific method to perform tasks and more about the reasons that several different methods work (and why sometimes only one way works). I am glad I am taking this class, and I will be glad when it is over… Meantime, I will finish the reading and exercises for the chapter on fractions tonight and take the test tomorrow morning, leaving some writing and summarizing for later. 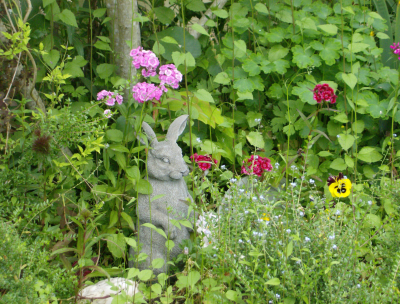 Here are the pictures we took of the garden on Tuesday. 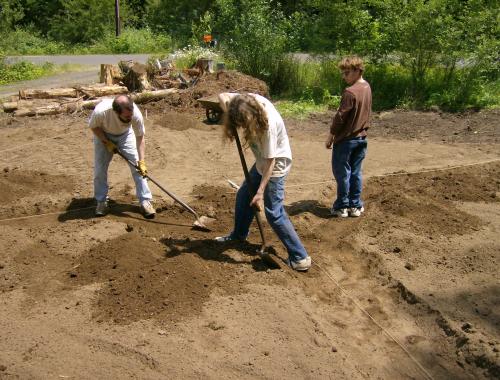 We have pretty much finished forming the basic shape, and have just to do the “finish work” on the remaining two large beds — leveling and breaking up the larger clods. 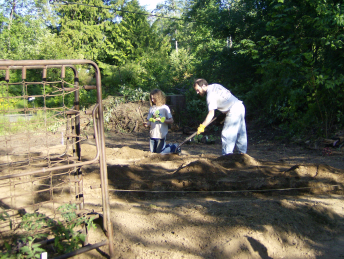 We are not yet screening the soil, but it will need to be done when we add compost and such next year. Last Tuesday, Tom’s parents came through and we had supper together in Olympia. 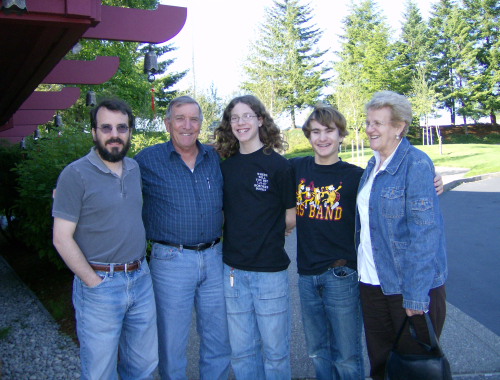 Left to Right: Tom, Grandpa, Stidkid#2, Stidkid#1 and Grandma. It was so nice to see them, I hope we can get together again soon. I am in the picture only virtually. I held the camera. We spent two hours this morning working on the garden. 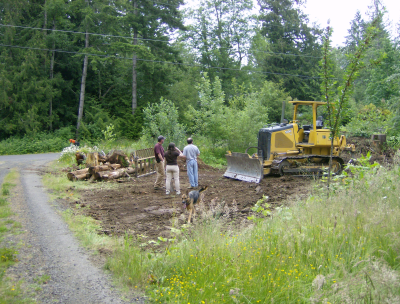 Despite having our neighbor do most of the heavy work with his dozer, we still need to form paths, infill at the back and build up the actual planting beds. 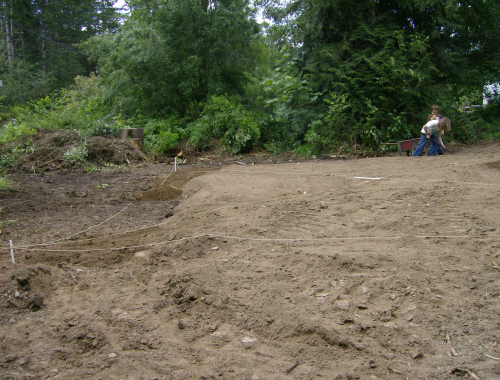 This first pic shows the amount of dirt that is being moved to fill in at the back of the garden. A quick note — we have pre-built panels that are about 7.5 feet long, which dictates a length of at least three panels (22.5′) or four (30′) on each side. 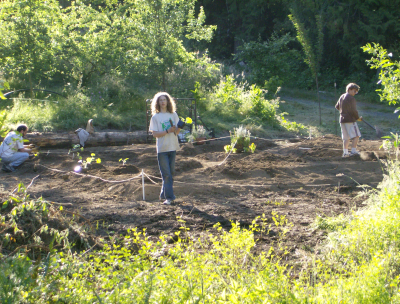 Rather than waste any of the good soil (the current level of soil outside the garden is the topsoil that is found naturally, high in clay and low in nutrients), we chose to maximize the garden space with a square. The next picture shows how we started scratching out the paths. I have drawn a rough sketch (similar to the many “dream” sketches I have drawn since we moved here) that we are following. The idea is to have some perimeter paths around each trapezoidal bed that allows me to get the big wheelbarrow in (needs 2.8′) close. The trapezoids will be further divided into workable spaces with foot-width paths. Here is a good picture of how wide the paths really are, the menfolk working hard. Of course, I was doing my share of shoveling, too (but someone had to take pics)! 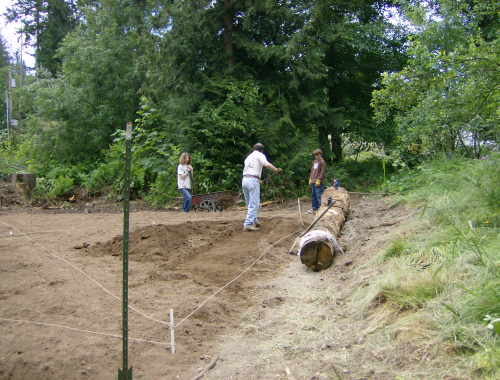 And one last, showing the first trapezoidal bed almost ready to plant. By this time, it is 1 p.m. and the sun has come out, so it’s time to go inside and rest before running out to the store for starts! On the list: tomatoes, peppers, lettuces, “whatever looks good” — we’ll plant seeds later. 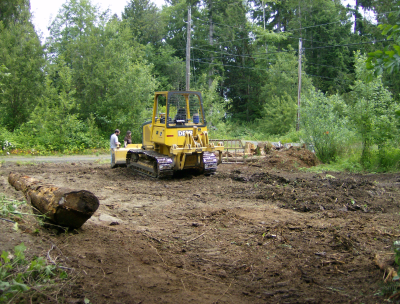 While he got started clearing the space of small trees, wicked thorny things and the occasional log or stump left over from the initial site clearing 9 years ago, Tom and I went into town to see about getting a bit of top soil to help level it out. We went where our neighbor suggested, but were not smart enough to insist on talking to the person he suggested. So instead of perfectly good but slightly lumpy topsoil we got the ulta-nice fine-screened stuff. It wouldn’t be a big deal, but we spent about twice what we would have for the other kind, and I feel badly that our neighbor had gone out of his way to help us find something more affordable and then we mucked it up. 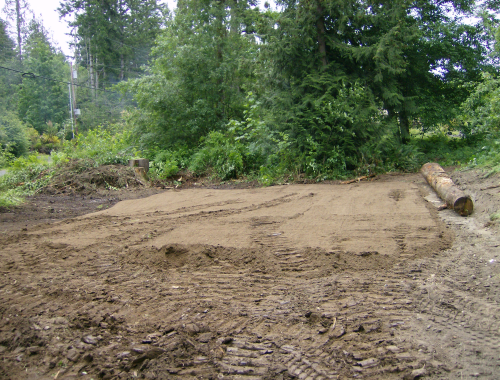 In the end, though, we have a lovely pad about 35 x 25 feet square to play with (we’ll end up making it closer to 30×30), weed-free and ready to go. This evening, stidkid#1 and I are going to lay out the shape of the beds with string and tomorrow we may even plant. Then, over the next 2 months or so, we’ll put up the fence panels that have been patiently waiting in the back yard, so the deer don’t decide we have just put in a buffet. 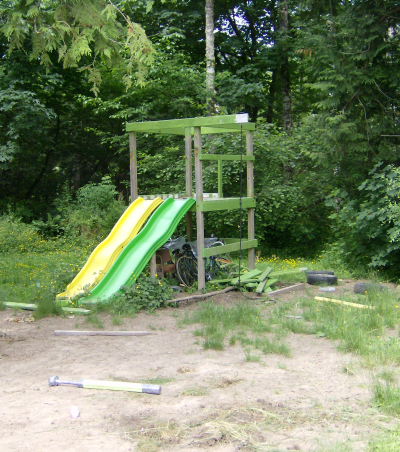 Here are the pics the stidkid took for me while Tom and I spoke with our neighbor about how to move things around. You can see a big pile of stumps, they now provide a bit of a buffer at the end of the drive behind the mailbox. The willows were left in place intentionally to serve as a nice hedgerow between the road and the garden. We’ll coppice them every few years and let them provide habitat for the critters. 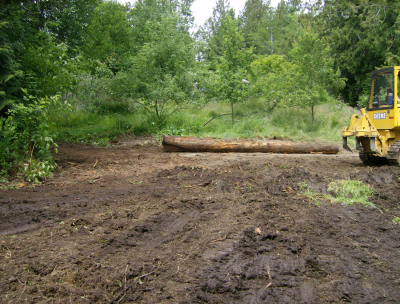 This next image shows the HUGE cedar log that is still mostly intact after 5 years. We are using it to define the terrace between the orchard and the garden space. 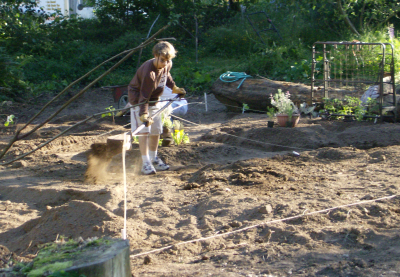 The soil behind it is mostly sand, in front mostly “skipopa silt-loam” which most of us consider just clay… We will be amending the garden soil regularly with gypsum to help keep the clayey bits from clogging the beds. 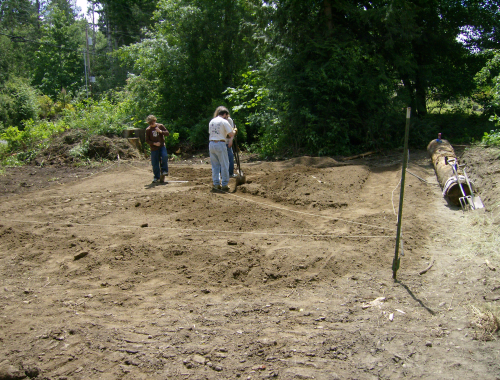 Here you can see how big the space is, before the garden is laid out. 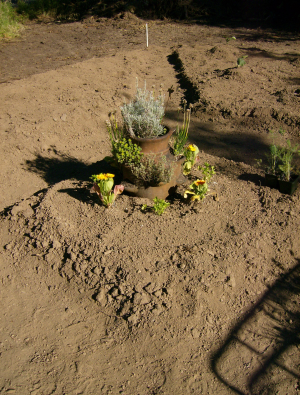 Here is the space, with the new soil nicely graded and shaped for the garden. Finally, while I have been planning and plotting the garden, the children are slowly deconstructing the fort we built for them 7 years ago. We will reuse the boards that are still good for a tree platform, later this year or next. Always another project on the horizon! 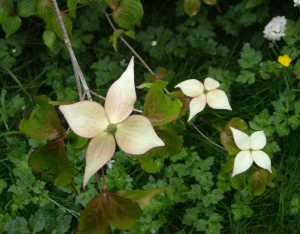 Here are the pics from this morning, this is the first year the Korean dogwood has really bloomed. I saw a couple bracts last year, but this year it is spectacular. The grasses and weeds in most of the yard are knee-high to me (our babble friend “riemann” would claim that makes it ankle-high to him). It hasn’t been sunny and warm enough for me to want to spend my few leisure moments outside lately, but I keep hoping. 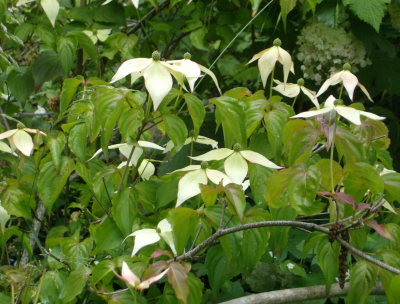 Meantime, here are a few pics of the nicer spots, starting with two of the Korean Dogwood, so you can see the bract (those are the parts that look like petals) shape and how they droop. A gorgeous view looking north across the mound. 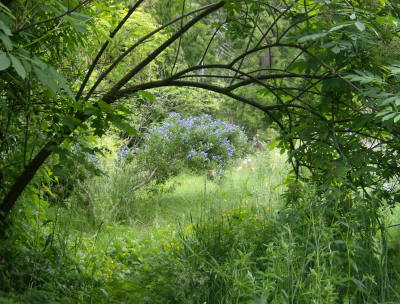 The California lilac is framed beautifully by the arch of the elderberry. I love the purple-blue cloud that is formed by this shrub! 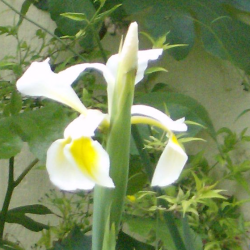 And I leave you tonight with a small picture of the white iris that is blooming outside my window. I saw on Yahoo’s news that there was a vulnerability found in firefox pretty quick… but it applied to the old version as well as the new. I know they will get a patch soon, but it’s a little sad to have all the hoopla and then get this the first day. Go to Yahoo’s story, and rest assured, as soon as firefox has a patch, they will let us know. I am dipping my toes back into the pool of academia, it seems. Nearly 20 years post-baccalaureate, I have decided that I was wrong (all those years ago) to reject going into teaching. After my experiences of the last couple years, I have decided that I am, in fact, willing to do something I love in spite of the rather onerous burdens currently being placed on teachers and students in my state (and as I hear, all the states).